About These stunning Victorian oak doors are well made, heavy and in excellent structural condition. Condition report: Finished in old varnish, they have no handles or rebate and have single clear glazing. One has an area of repair to the top, which has been stained to match. There are some scratches and have been adapted from swing doors. Very good structural condition. No damage to glazing. They have all hinges present. Style: Victorian Date of manufacture: circa 1890 Materials and techniques: Hand crafted, oak, glass Wear -Wear consistent with age and use -Minor losses, scuffs and scratches. -Historic repairs -Recent repairs Dimensions: Height 223 cm Width 147 cm for both (1 x 74.5 cm, 1 x 72.5 cm) Depth 4.5 cm Weight 80 kg. 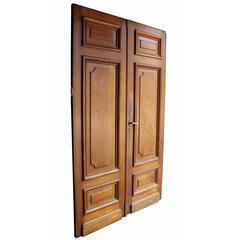 Pair of antique exterior oak double-door. With raised and fielded panels. 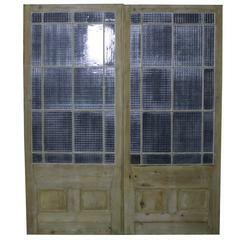 English Renaissance style oak framed doors with arch top and leaded-glass panel with round medallion (19th century). English Gothic style stained oak door with leaded glass panels and diamond design with cross, (19th century).